Usually thought of mainly for pregnancy massage, side lying techniques can also be used for any clients who may be unable to lie comfortably in prone or supine positioning. Individuals with recent surgeries, obese clients or simply for easier access to certain areas of the body are all potential recipients of side lying massage techniques. It can easily be integrated into traditional massage techniques and often provides the best access to shoulder, neck, low back and hip areas as well as allowing for more effective stretches in those areas. Define the cautions and contraindications for side lying massage techniques. Identify the techniques and sequence for side lying variations on the client's back, including muscles of spine, neck, shoulder, cervical, thoracic and lumbar areas, while facing the client. Recognize the techniques and sequence for side lying variations on the client's back while standing behind the client. List and describe side lying techniques and sequence used on the arm of the client. Discover the side lying techniques and sequence used on the top portion (thigh) of the client as well as explain recommended draping techniques. Investigate the side lying techniques and sequence used on the lower leg (calf), including transitioning to foot. Identify the side lying techniques and sequence for the foot of the client. Review additional side lying techniques, including facilitated stretching. Presented by Dr. James Mally, massage therapist and instructor since 1979, you will be able to enhance your practice by being able to work with clients in a more three-dimensional way. The DVD was excellent and provided several more efficient techniques to my orthopedic massage practice. The techniques were well displayed and explained. This one rates a strong 10! You’ll be glad you took this course. Just a quick note to let you know how much I enjoyed your CEU course on Side Lying massage purchased through Integrative Healthcare. I've been performing Orthopedic and Sports massage for almost 20 years, have taken many classes and CEU courses that included some side-lying work, and nothing has compared to this course. I acquired a plethora of more efficient techniques and great side-lying ideas to include in my own practice. I absolutely LOVED the facsilitated stretching and (side-lying) body positioning for better access to those chronically "tight" areas. You get a high "10" for this course and I thank you very much! I highly recommend this course, the 2 DVD's were very unique in that you can put a certain technique on continuous play while you practice. Also, the workbook that followed the DVD's was equally useful as you can prop it up without a book stand near the massage table and the print is large enough to read while you are practicing. Even though I've been using the side lying position for years already I definitely learned new thing that I am looking forward to sharing with my clients. I was very impressed with the entire course from the workbook to the dvds. It was so comprehensive and easy to understand. The videos were absolutely top notch, with many viewing options - and can be referred to over and over. I loved this course! Dr Malley has always presented well organized and informative courses.He makes learning a relaxing and fun experience. I would recommend his courses to everyone interested in learning massage techniques with a master's touch. The video to this course was excellent! I have been adding the side lying techniques to my practice and people love it. Very effective, especially the neck work. Thank you. Great course with excellent materials for learning. I will definitely use these techniques in my practice. As always, your Side Lying Massage Course has exceeded my expectations. I previously had learned side lying massage back when I was going to Massage School in 1999. I never enjoyed doing side lying massage. Taking this course has definitely changed my opinion about doing this type of massage. Wow!! Great class and much needed by me! Canâ€™t wait to try it out in my clients. Thank you! Overall, I really enjoyed the content and flow of this course. I especially loved how Dr. Mally broke down each of the massage techniques separately and then put them into a sequence so that you could see the flow of the strokes from one into another. Well done! It made it easier to practice the techniques. Thank you!!! The printed material with pictures, and the DVD, will be helpful for review and practice. Very useful. What a great course! The DVDs were so helpful and the workbook. I can't wait to start using the side lying techniques in my massages. Four clients popped into my head that will absolutely benefit from what I learned. Thank you! Excellent videography - the best I have seen to be able to continuously watch a technique while practicing. Superb for the visual learner! Great to have each technique broken down & then perform a sequence. I appreciate all the techniques in picture form on one page at the end of each section. 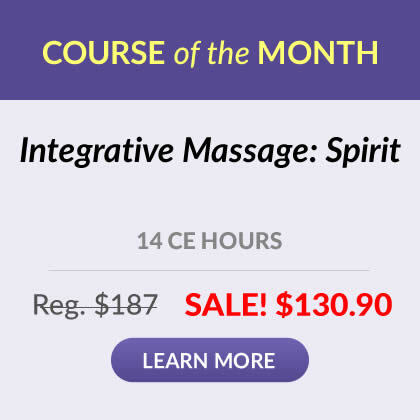 Course is an excellent resource for any stage in your massage career. I have been a massage therapist since 1998 and I find I've learned a lot from this course especially with people who have shoulder issues. I especially liked that a female was used as a model to show proper draping during the massage. Enjoyed the course. Great course offerings and this course in particular was excellent. I've passed your website on to several co-workers already! I love the flip book as reference guide; will help to let clients know as well what to expect. The DVD was very informative and I like the loop back and other options to encourage accuracy in performing technique. This teaching has me excited about working on some of my athletes. Will definitely refer this teacher. I liked the simplicity and clear, direct presentation. It was clear and focused without any extra or unnecessary information or "fillers". The shoulder work was very thorough with techniques to release the neck, shoulder and scapula. This provided ways to work for those who have to be in side lying as well as creative options to keep things interesting for those that don't. I enrolled in this course as a refresher, since I had an introduction to side lying techniques during my massage therapy training. So my expectations were low and almost ho-hum. Pleasant surprise!! Both the videos and the print materials are magnificently organized. The opportunities to review particular holds/methods/motions on the video in one click is fabulous. And I (unexpectedly) learned techniques I will definitely integrate into my practice. 5 stars. Bravo!! As the lead therapist at my work, my prenatal and side lying massage techniques are hard to instruct on with new therapists. This course was SO very helpful with opening up new ways to gain better access to so m,any areas. I am eager to start using these in my practice and showing my fellow therapists new ways to help the clients. I was able to use the course materials immediately in my practice. I appreciate the access to specific muscle groups that side lying massage provides. The companion workbook format, as well as the 2 DVD's was well thought out and a great addition to the clearly filmed video segments. Thank you for such a complete course. I highly recommend this educational course. The Side-Lying Massage course exceeded my expectations. The material was very easy to understand. I liked the workbook that can stand on edge and the content in it was very clear and concise. The videos were also very good. I can't wait to use these techniques in my practice, and I would recommend this course to anyone. After taking this course, I am interested in taking other courses taught by Dr. James Mally. I work with the elderly and people with spinal cord injuries and I took the course to assist me with those clients who do not turn over or cannot lie prone. I found many techniques are not applicable to fragile populations. Dr. James Mally is great! Very easy to follow and I plan to add it to my practice library. As I watched, I was thinking about which clients would benefit from his techniques. This course is excellent! I enjoyed the video instruction along with the booklet designed to stand up shile you practice the techniques- Excellent! The presenter was knowledgeable and the information easy to comprehend. It was helpful for Dr. Mally to discuss attachment sites and actions of many of the muscles, which was both a "refresher" as well as an easy way to understand the techniques. 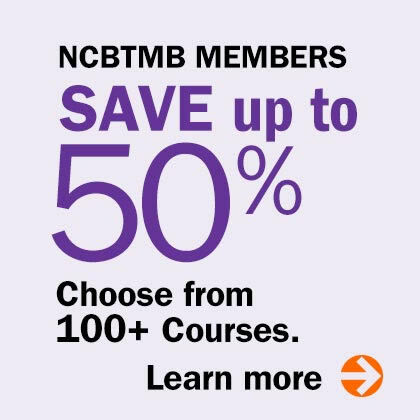 I have been trying to find this course for awhile and it kept getting canceled. I am really glad I did home study because now I can refer back to the video or chart. Thanks so much! I have been doing massage for 15 years. This information and presentation of material is going to provide great techniques to add to my practice. This is the best side lying instruction I have received. I truly enjoyed the Side Lying Massage course. I found the DVD’s to be very through and informative. I plan to review them frequently as I have several non-pregnant clients that need to be side lying. Excellent presenter and the best DVD and materials I have seen so far because of their clarity of the presentation and materials. I got a lot out of watching the DVD’s. It’s great to refer back to. I highly recommend this course for massage therapist performing clinical work. The techniques provided in this home study class takes the guess work out of how to access the origins, insertions with ease! I am a visual learner, I like the DVD with the book; helps me so I can go back and review. Thank you! I knew this would be a great course because I studied Dr. Mally's deep tissue and sports massage books back in school over ten years ago and I still flip through as a refresher. Thank you!! It was easy to modify this technique to fit my client's needs. Thank you. I really liked that there was a workbook to supplement the DVD. Also like the format of the DVD in that you could watch entire sections or just specific moves to practice them. Great format! This was one of my favorite courses. The content was very clear & concise. I’m very excited to incorporate what I’ve learned into my own practice. This course, I have found, has opened up a whole new world in the side lying technique. I found Dr. Mally to be clear and concise, humble too! Nice delivery. Thank you. This course provided excellent instruction for side lying massage. It addressed all major muscle players that are most often not addressed. This course has a lot to offer anyone regardless of their skill set. I enjoyed this class tremendously. I learned some wonderful, new techniques that I will put into my practice. Very good CEU course - thorough, SAFE, simple. Excellent pictures and video. Thank you! I enjoyed the course. The DVD was great as well as the book. I got a lot out of it. I like that the video matched up with how you flipped through the book. Good format. Straightforward information with relevant test.